Lives and is restricted to deep (200-2000m) Antarctic waters. By realizing that this species is particularly vulnerable to overfishing due to its particularly low resistance and long recovery time of stock (1). The Patagonian toothfish has extremely high market values, and as the population of these fish continues to be depleted, this value only increases. 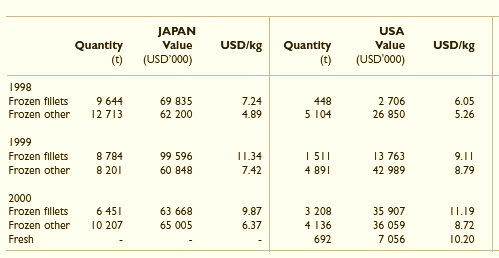 The pricing of these fish are sensitive to the costs of landing and importation, and as these fish are primarly imported to the North American and Japanese markets, the price change can be seen clearly through these two markets (2). The Patagonian toothfish is now considered one of the most valuable fish species on the market, and can at times cost about USD 4.55 per pound at landing (1). This is the most valuable fish within the CCAMLR, and thus strict regulations are needed to prevent severe IUU overfishing of the Patagonian toothfish (2). The first IUU Fishing spotted in the Southern Ocean of the Patagonian toothfish occured in 1994 in South Georgia and spread rapidly and increased to all other locations by 1997. In 1997, the CCAMLR officially recognized the impact of IUU fishing as a serious threat to the sustainability of the Patagonian toothfish fishery in the Southern Ocean (2). 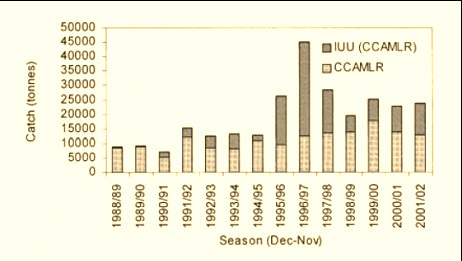 As seen in the figure above, the impacts of IUU fishing in the Convention area had already started to take effect and in the 1996/1997 season, it was estimated that 68,234 t out of the total estimated catch of 100,970t was landed by IUU fishing activities (2). IUU fishing is known to be conducted by FOC vessels registered through Belize and Panama, many of these IUU owners or operators are known to be Spanish nationals (2). IUU fishing during the years shown in above were known to be landed in the Ports of Durban, Monevideo, Louis, Vigo, and Walvis Bay. 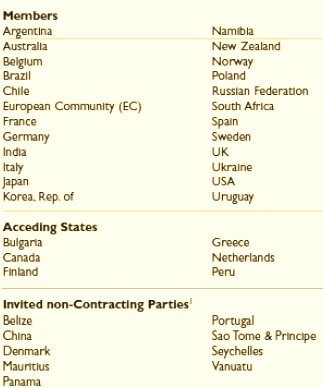 However, all of these have currently become Members of the CCAMLR or are Asceding States to the CCAMLR as shown in  above (2). What Has the CCAMLR Done to Prevent IUU Fishing in the Southern Ocean for Patagonian Toothfish? 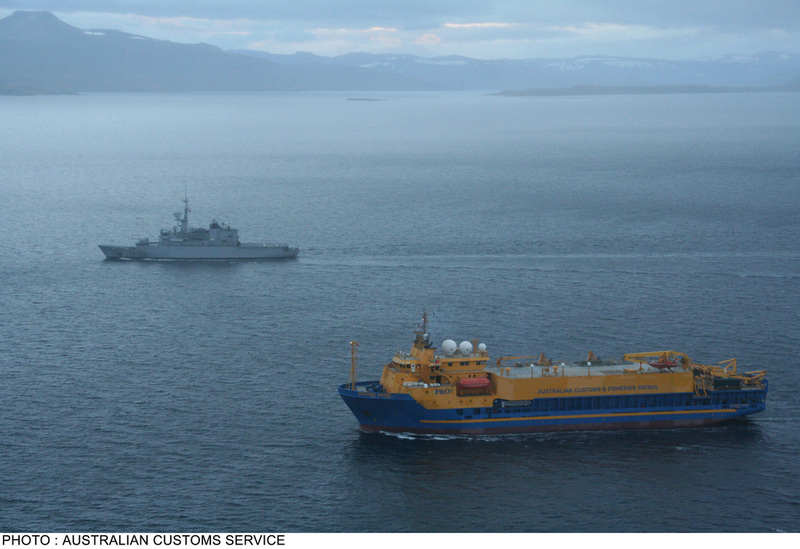 Australian navy inspects illegal fishing Patagonian toothfish vessel. Picture courtesy Australian Customs and Border Protection Service. However, despite the attempts at preventing IUU fishing in the CCAMLR Area, there is still an abundant amount of IUU fishing that corrupts the sustainability of this fishery. 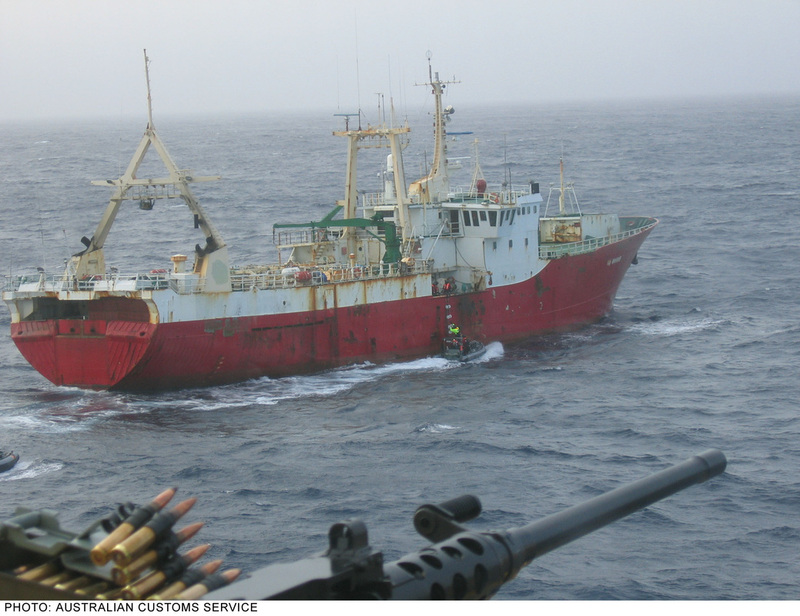 Although, the CCAMLR is still combating the IUU fishing problem within it's convention by holding to its Conservation Measures, as shown in photos  and . Southern Ocean patrol identifies toothfish boats outside Australian waters. Picture courtesy Australian Customs and Border Protection Service. (1) K. W. Riddle, Illegal, unreported, and unregulated fishing: Is international cooperation contagious? Ocean Development and International Law 37, 265 (Jul-Dec, 2006). (3) Kock, K. H., Reid, K., Croxall, J., Nicol, S. "Fisheries in the Southern Ocean: an ecosystem approach. Philosophical Transactions of the Royal Society B-Biological Sciences" 362, 2333 (Dec, 2007). (4) Agnew, D.J., "The illegal and unregulated fishery for toothfish in the Southern Ocean, and the CCAMLR catch documentation scheme." Marine Policy 24, 361 (Sep, 2000). 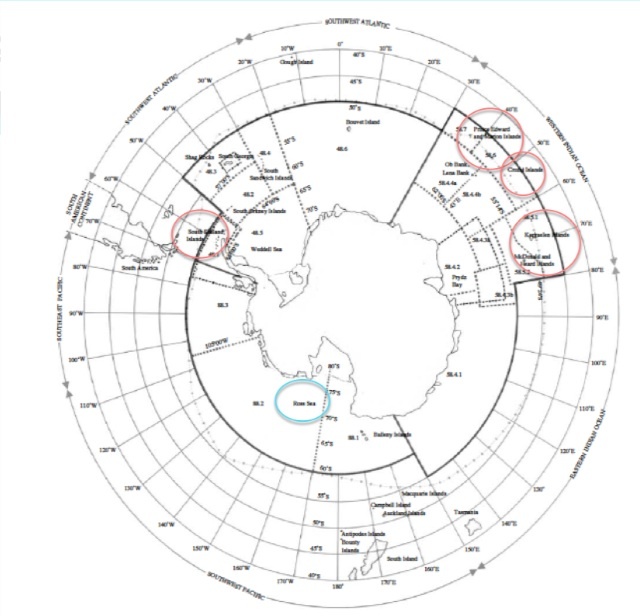 Area of the CCAMLR Kock, K. H., Reid, K., Croxall, J., Nicol, S. "Fisheries in the Southern Ocean: an ecosystem approach. Philosophical Transactions of the Royal Society B-Biological Sciences" 362, 2333 (Dec, 2007). Members of the CCAMLR. Croxall, J.P. and Nicol, S., "Management of Southern Ocean fisheries: global forces and future sustainability." Antarctic Science 16 (4): 569-584 (2004).